PubMatic has long operated under the principle that diversity of thought is the key to success in an innovation-fueled global economy. Getting to the forefront of digital advertising innovation requires a purposeful effort to hire, develop and retain a global team of unique individuals and, in turn, provide them with an environment that cultivates and supports their diverse perspectives. Staying at the forefront of digital advertising innovation will require even greater effort as new generations of employees redefine engagement, crave a deeper connection to their work and seek to maximize their potential as human beings. We have worked hard to cultivate a diverse and inclusive culture at PubMatic, and we are building people strategies and executing plans that support what we believe to be critical truths for our continued success. 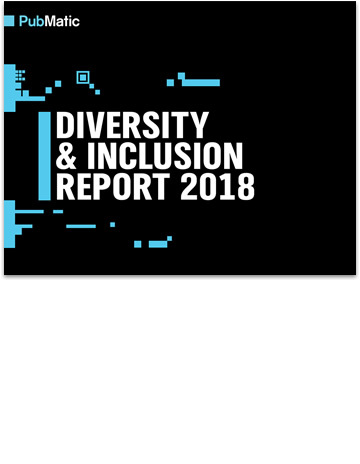 The 2018 Diversity & Inclusion Report highlights the company’s commitment to diversity and inclusion, and outlines PubMatic’s demographics related to inclusion, hiring, promotion, leadership, engineering and compensation. We are proud of the results that we achieved, and understand that there is still work to be done both at PubMatic and within our entire industry.